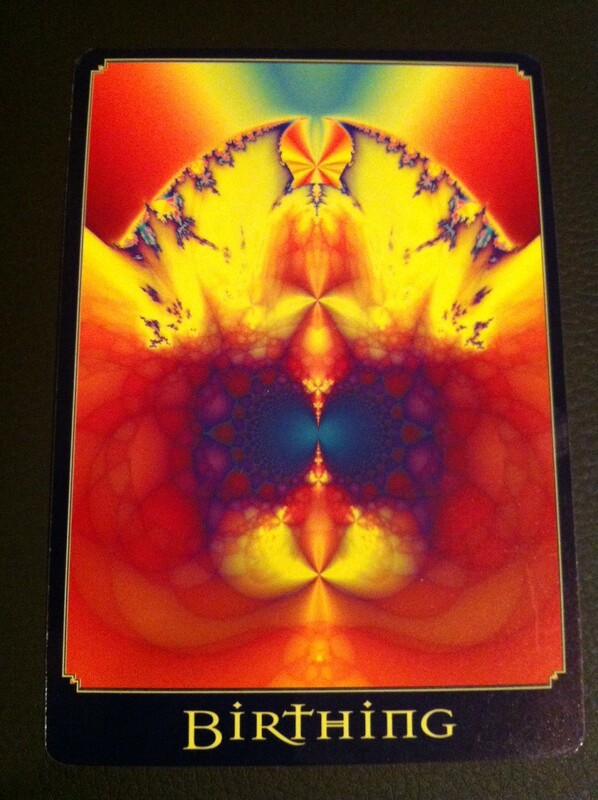 Card: Birthing – from the Return of Spirit oracle cards by Cheryl Lee Harnish. “When we are in the process of creating something new in our life, we are actually calling on our Divine force, and mastering our gifts as creators, to bring something new into this world. Trust yourself in all that you are doing at this moment. Your instincts and intuition will guide you. The goals, projects, or ideas you are working on are important in the cosmic plan. There are many higher energies working with you, and through you, to help you complete what you are working toward…. Message from The Faeries: The new year is almost here! It is time to start thinking about all the new projects you want to start, all the new lifestyle changes you want to make, and all the new things that you want to come into your life. It is also time to let go of all the things are no longer serving you, and it is time to put behind you 2013. We love creation. Another way to think about it is that the things you want to create for 2014 is your garden. Start planning out your garden this week. What kinds of things do you want to grow? Where do you want to plant them? What do you want your garden to look like? Then once you have an idea as to what you want your garden to look like, it is time to start planting the seeds. Planting the ideas. Planting your dreams, desires and wishes. Then you will give your garden (yourself) lots of love, caring, nurturing, and fertilization. Then you sit back and enjoy as the Universe works it’s magic to let your garden blossom into your beautiful creation. We know that we’ve told you this before, but we feel the need to remind you again: Dream big! Don’t put limitations on the type of garden you want to grow for yourself. Stop worrying too. Don’t worry about the potential pests that might take over your dream garden, if the climate is going to be okay, if the land is fertile enough, or that it isn’t going to work out. Your thoughts, your worry, can have a tremendous influence on whether or not your dreams will come to fruition. Also, don’t let other people tell you how to grow your garden, and don’t let them tell you what you can or can’t have. Trust and believe in yourself. Just sit back and let us, the faeries, work our magic. 2014 is going to be an exceptional year, so it’s up to you make it exceptionally exceptional.